"LAFC" redirects here. For other uses, see LAFC (disambiguation). Los Angeles Football Club, commonly referred to as LAFC, is an American professional soccer franchise based in Los Angeles, California, that competes in Major League Soccer (MLS) as a member of the Western Conference. The team plays their home games at the Banc of California Stadium in Exposition Park. The team shares the Los Angeles area market with the LA Galaxy, and the two clubs compete in a rivalry dubbed El Tráfico. On May 17, 2015, the team chose the Los Angeles Memorial Sports Arena site to build a 22,000-seat state of the art stadium for the MLS in Exposition Park, costing $250 million. The group estimated the project would create 1,200 temporary construction jobs and 1,800 full-time jobs, generating $2.5 million in annual tax revenue. The environmental impact report, arena demolition, and stadium construction were expected to take three years and delay the team's debut to 2018. On May 6, 2016, the Los Angeles City Council approved the stadium, clearing a way for the construction of the stadium. After the 2014 launch, supporters were consulted on many of the club's early decisions including the team colors, the look of the crest and the design of Banc of California Stadium, built on land previously held by the LA Sports Arena. Much of the marketing focus was to millennials, which led to the decision to play near downtown Los Angeles. LAFC took a grassroots approach to building the club by founding the LAFC academy and signing younger prospects including Americans Walker Zimmerman and Los Angeles native Tristan Blackmon, Portuguese draft pick João Moutinho,  and Uruguayan prospect Diego Rossi. The club's main rival is the LA Galaxy, who play in the Los Angeles suburb of Carson. ^ "The First Captain in Club History". Los Angeles Football Club. March 16, 2018. ^ a b "Our Ownership". Los Angeles FC. Retrieved January 8, 2015. ^ Bartlett, Blair (September 15, 2015). "Los Angeles' newest Major League Soccer team announces official club name and launches collaborative effort with supporters to identity club colors with social media campaign" (PDF) (Press release). Los Angeles Football Club. Archived from the original (PDF) on September 16, 2015. Retrieved September 15, 2015. ^ Baxter, Kevin (May 17, 2015). "Expansion L.A. soccer team plans new stadium on Sports Arena site". Los Angeles Times. Retrieved May 18, 2015. ^ "Major League Soccer awards new team to Los Angeles". October 30, 2014. Retrieved January 30, 2018. ^ "LA's MLS expansion team announces official club name: Los Angeles Football Club". MLSsoccer.com. September 15, 2015. Retrieved September 16, 2015. ^ a b c Grant Wahl. "How did LAFC come to be? These businessmen are behind MLS' newest team". Sports Illustrated. Retrieved September 16, 2015. ^ Baxter, Kevin (July 27, 2017). "Bob Bradley is back in the MLS to become Los Angeles Football Club's first coach". Los Angeles Times. Retrieved March 5, 2018. ^ Dwyer, Alex (September 12, 2017). "Spanning the globe: LAFC casting wide net in search of players". MLSsoccer.com. Retrieved March 5, 2018. ^ Baxter, Kevin (August 11, 2017). "Carlos Vela happy — but lonely — as LAFC's first designated player". Los Angeles Times. Retrieved March 5, 2018. ^ Baxter, Kevin (March 4, 2018). "LAFC thrill new fans by winning their inaugural game against Seattle Sounders". Los Angeles Times. Retrieved March 5, 2018. ^ Ian Quillen (March 31, 2018). "LA Galaxy 4, Los Angeles Football Club 3 | 2018 MLS Match Recap". MLSsoccer.com. Retrieved May 15, 2018. ^ Lutz, Tom (March 31, 2018). "Zlatan Ibrahimovic's low-key MLS debut: a wondergoal then the winner for LA Galaxy". The Guardian. Retrieved May 15, 2018. ^ Quillen, Ian (March 31, 2018). "LA Galaxy 4, Los Angeles Football Club 3 2018 MLS Match Recap". mlssoccer. Retrieved July 21, 2018. ^ "LAFC Completes Historic Road Trip". April 23, 2018. ^ "LAFC quietly sets record for away victories in inaugural season". September 6, 2018. ^ a b "LAFC secure best regular season points total ever by MLS expansion team". October 29, 2018. ^ Press, Associated. "LAFC clinches playoff spot in its expansion season with 3–0 win over Rapids – Los Angeles Times". Los Angeles Times. Retrieved October 29, 2018. ^ "Damir Kreilach helps Salt Lake shock LAFC, advance to West semifinals". November 1, 2018. ^ "Our Crest". Los Angeles Football Club – LAFC. Retrieved January 13, 2016. ^ Couch, Ben (January 7, 2016). "LAFC unveil crest, logo, colors ahead of MLS launch in 2018". MLSsoccer.com. Retrieved January 7, 2016. ^ "LOS ANGELES FC". Matthew Wolff Design. Retrieved January 7, 2016. ^ a b "LAFC And YouTube TV Form Historic Broadcast And Jersey Partnership". Los Angeles FC. January 31, 2018. Retrieved February 26, 2018. ^ a b Baxter, Kevin (January 31, 2018). "LAFC reaches jersey, streaming deal with YouTube TV". Los Angeles Times. Retrieved January 31, 2018. ^ Baxter, Kevin (May 17, 2015). "Expansion L.A. Soccer Team Plans New Stadium on Sports Arena Site". Los Angeles Times. Retrieved January 13, 2016. ^ "LAFC owners join with Los Angeles business and community leaders to break ground on Bank of California Stadium" (Press release). Los Angeles FC. August 23, 2016. Archived from the original on August 25, 2016. Retrieved August 23, 2016. ^ Koren, James Rufus (August 23, 2016). "Banc of California snags naming rights for L.A. Football Club soccer stadium". Los Angeles Times. Retrieved August 23, 2016. ^ Novy-Williams, Eben (August 23, 2016). "Bank Run by 41-Year-Old Signs $100 Million Stadium-Name Deal". Bloomberg News. Retrieved August 25, 2016. ^ "LAFC Job Fair Flyer" (PDF). Los Angeles Football Club. March 10, 2016. Archived from the original (PDF) on April 19, 2016. Retrieved June 9, 2016. ^ Brewer, Ashley (April 18, 2018). "Los Angeles Football Club's Banc of California Stadium officially unveiled in Exposition Park". ABC 7. Retrieved April 18, 2018. ^ Baxter, Kevin (December 18, 2017). "LAFC's stadium is coming together ahead of schedule". Los Angeles Times. Retrieved December 18, 2017. ^ a b "Boxscore: Los Angeles Football Club vs. Seattle Sounders FC 04/30/2018 | Matchcenter". Matchcenter.mlssoccer.com. Retrieved May 15, 2018. ^ "LAFC supporters group has helped team establish its new identity". ^ Baxter, Kevin. "Marketing to millennials, Los Angeles Football Club looking to stand apart". Los Angeles Times. Retrieved March 31, 2018. ^ Baxter, Kevin (January 29, 2018). "LAFC make Joao Moutinho its first-ever draft pick". Los Angeles Times. Retrieved January 30, 2018. ^ a b Wiebe, Andrew (March 28, 2018). "Wiebe: First-ever "El Trafico" will lay stakes for LA Galaxy-LAFC rivalry". MLSsoccer.com. Retrieved March 30, 2018. ^ "Supporters | Los Angeles Football Club". Lafc.com. September 26, 2017. Retrieved May 15, 2018. ^ Radio, Southern California Public (April 18, 2018). "LA Football Club diehards wanted a stadium that was loud, intimidating and never let you sit down". Retrieved May 15, 2018. ^ "LAFC introduce falcon as Banc of California Stadium pregame ritual". April 30, 2018. ^ "Falcon | Los Angeles Football Club". LAFC.com. April 19, 2018. Retrieved October 4, 2018. ^ "What are we calling the LA Galaxy LAFC rivalry?". LAG Confidential. Retrieved April 3, 2018. ^ a b Baxter, Kevin (March 28, 2018). "Galaxy and LAFC fans are taking new rivalry very seriously". Los Angeles Times. Retrieved March 29, 2018. ^ "Poll: What should we call the LAFC-LA Galaxy rivalry?". Angels on Parade. Retrieved April 3, 2018. ^ Davis, Matt (March 29, 2018). "Will Ferrell v Zlatan Ibrahimovic? Los Angeles FC prepare to face Galaxy on derby day". BBC Sport. Retrieved March 31, 2018. ^ "L.A.'s traffic congestion is world's worst for sixth straight year, study says". Los Angeles Times. February 6, 2018. Retrieved March 31, 2018. ^ Lalas, Alexi [@AlexiLalas] (March 28, 2018). "The first-ever @LAGalaxy vs. @LAFC game is Saturday 3 pm ET on @FOXTV. This LA derby is being called "El Tráfico." @MLS says the fans came up with the name and the League has no plans to trademark it. #ElTrafico #LAvLAFC" (Tweet). Retrieved March 29, 2018 – via Twitter. ^ Lutz, Tom (March 31, 2018). "Zlatan Ibrahimovic's low-key MLS debut: a wondergoal then the winner for LA Galaxy". The Guardian. Retrieved March 31, 2018. ^ Lalas, Greg (October 26, 2009). "L.A. derby finally means something". Sports Illustrated. Retrieved March 31, 2018. ^ a b "LAFC Ownership". Los Angeles FC. October 5, 2017. Retrieved February 26, 2018. ^ Mendola, Nicholas (October 30, 2014). "Los Angeles officially given new MLS team; Magic Johnson, Vincent Tan among investors". NBC Sports. Retrieved October 30, 2014. ^ "Will Ferrell announced as LAFC part owner". Sports Illustrated. January 7, 2016. Retrieved February 26, 2018. ^ Wallenstein, Andrew; Spangler, Todd (January 31, 2018). "YouTube TV Strikes Unprecedented Deal for Pro Sports TV Rights". Variety. Retrieved January 31, 2018. ^ April 2, 201811:12AM PDT (April 2, 2018). "LAFC Announces Broadcast Partnership With Univision Los Angeles | Los Angeles Football Club". Lafc.com. Retrieved May 15, 2018. ^ "LAFC Announces ESPNLA 710AM & KFWB 980 AM As Official Radio Broadcast Partners". Lafc.com. March 1, 2018. Retrieved May 30, 2018. ^ "Los Angeles FC Roster". Retrieved July 5, 2018. ^ "Los Angeles FC Technical Staff". November 2, 2017. ^ "Los Angeles FC Team Management". October 5, 2017. ^ "LAFC, Orange County Blues FC Announce Multi-Year Partnership". United Soccer League. December 7, 2016. Retrieved December 10, 2017. ^ Staff, MLSSoccer.com (December 14, 2018). "LAFC announce end of USL affiliation with Orange County SC". Alicia Rodriguez. Retrieved December 14, 2018. ^ "U.S. Soccer Development Academy Adds 56 Clubs at Under-12 Division for 2016–17 Season". United States Soccer Federation. February 2, 2016. Retrieved February 3, 2016. ^ "LAFC Academy – Staff". lafc.academy. Retrieved March 23, 2018. ^ Rodriguez, Alicia. "LAFC win 2018 U-13 Concacaf Champions League". mlssoccer.com. Retrieved January 15, 2019. 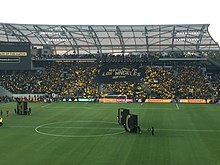 Wikimedia Commons has media related to Los Angeles FC.